The agent also uses everyday language that non-experts can understand. The explanations, or "rationales" as the researchers call them, are designed to be relatable and inspire trust in those who might be in the workplace with AI machines or interact with them in social situations. "If the power of AI is to be democratized, it needs to be accessible to anyone regardless of their technical abilities," said Upol Ehsan, Ph.D. student in the School of Interactive Computing at Georgia Tech and lead researcher. "As AI pervades all aspects of our lives, there is a distinct need for human-centered AI design that makes black-boxed AI systems explainable to everyday users. Our work takes a formative step toward understanding the role of language-based explanations and how humans perceive them." Researchers developed a participant study to determine if their AI agent could offer rationales that mimicked human responses. Spectators watched the AI agent play the videogame Frogger and then ranked three on-screen rationales in order of how well each described the AI's game move. Of the three anonymized justifications for each move—a human-generated response, the AI-agent response, and a randomly generated response—the participants preferred the human-generated rationales first, but the AI-generated responses were a close second. 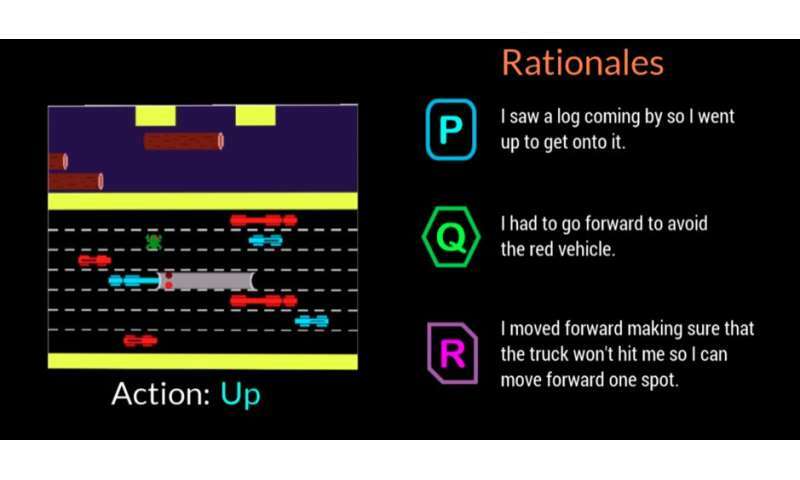 Frogger offered the researchers the chance to train an AI in a "sequential decision-making environment," which is a significant research challenge because decisions that the agent has already made influence future decisions. Therefore, explaining the chain of reasoning to experts is difficult, and even more so when communicating with non-experts, according to researchers. "This project is more about understanding human perceptions and preferences of these AI systems than it is about building new technologies," said Ehsan. "At the heart of explainability is sense making. We are trying to understand that human factor." By a 3-to-1 margin, participants favored answers that were classified in the "complete picture" category. Responses showed that people appreciated the AI thinking about future steps rather than just what was in the moment, which might make them more prone to making another mistake. People also wanted to know more so that they might directly help the AI fix the errant behavior. "The situated understanding of the perceptions and preferences of people working with AI machines give us a powerful set of actionable insights that can help us design better human-centered, rationale-generating, autonomous agents," said Mark Riedl, professor of Interactive Computing and lead faculty member on the project. The research was presented in March at the Association for Computing Machinery's Intelligent User Interfaces 2019 Conference. The paper is titled "Automated Rationale Generation: A Technique for Explainable AI and its Effects on Human Perceptions." Ehsan will present a position paper highlighting the design and evaluation challenges of human-centered Explainable AI systems at the upcoming Emerging Perspectives in Human-Centered Machine Learning workshop at the ACM CHI 2019 conference, May 4-9, in Glasgow, Scotland.